It seems inevitable that humanity will, at some point, reach out into outer space. Technically, we already have, with humans landing on the moon, and unmanned missions to Mars to explore the red planet. And now, there’s lots of talk not only about sending humans to Mars, but also potentially establishing a lunar colony, taking humanity’s first true step for a life in the starts. Iron Girl is a Play’n GO title set in this distant future, where our fierce heroine keeps an eye out for criminal scum, tries to find as many of them, and terminates them with extreme prejudice. You’ll find generic playing card icons such as the club, the diamond, the heart and the spade in alien looking designs and four wanted posters depicting different criminals. Iron Girl herself acts as a Wild. It’s no surprise that we’re fans of Play’n’Go’s titles here. The Swedish team have come a long way from their early days back in 1997, and today create games that are, in our opinion, on par with the biggest names in the slots industry. They’ve made some of our favourite games like Gemix, Grim Muerto and the Age of the Gods series, and their continued growth has been nothing short of a blessing for everyone involved. If there’s one developer we’d have to pick to play their titles for the rest of our lives, Play’n’Go would probably be our pick – all their games seem to have polish, love and care put into them, and what more can you want as a slots fan? The game really isn’t that complicated to get into, despite how confusing the paytable makes it seem at first glance. You have the familiar 5×3 playing field with 20 fixed paylines, meaning you can only adjust your wager to change your bet. You can bet between $0.20 up to $100, which should please both high rollers and casual gamblers alike. This Play’n’Go release also has an extensive Autoplay option, which allows you to pick the amount of spins, as well as allowing you to stop Autoplay if your balance increases or decreases past a certain limit, or if a single win goes above your expectations, and you want to bask in the glory of a massive score. Despite the effort put into the flashy visuals, there’s not much to the theme itself. You have a starry night sky as a backdrop, while the reels are made out of a holographic screen that our heroine uses to scan for villains so she can hunt them down. It’s simple, it’s to the point, and it looks so good that the minimal theme actually works out in your favour. 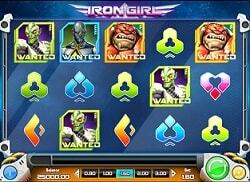 There are three bonuses in Iron Girl, one of which is attached to the other. The first special feature is the Villain Re-spins – once a winning combination is formed with a villain symbol, those icons become sticky and a re-spin will occur to potentially extend the winning combination and the amount of villains on the screen. After the win is paid out, the second feature comes into play. Depending on how many sticky villains were found on the playing field, you will get two additional Wilds, or an increasing multiplier that caps at x5 for a full reel of villains. The final bonus is a randomly triggered feature in which Iron Girl’s armour will fly over the reels, and drop up to five Wilds on the playing field. This feature can activate the villain re-spins. The game offers its players a 1000x win for a full screen Quake with a 5x multiplier – Quake being the highest paying villain symbol. The game has a medium volatility, meaning the balance between free spins and pays is relatively balanced – so while you won’t be carrying off mind-blowing jackpots, you also won’t be bored to death waiting for them to arrive, either. The title has an RTP of 96%, which is above average for video slots. We were a bit sceptical if Iron Girl really could have panned out successfully without a free spins bonus, but we were fortunately proven quite wrong in that regard. This Play’n’Go release has awesome pays, great visuals and engaging gameplay that will keep everyone on their toes – In a positive way!